Travel involves leaving things behind, and the holidays are a time to get reacquainted with them. This week I thought that I would talk about three swords and the different problems which they attempt to solve. At the top we have a Naue type II by Neil Burridge, the only man alive who has mastered the process of hammer-hardening the edges which was used on Bronze Age European swords. Neil can make bronze swords which would be very hard to distinguish from the originals, and provide them with scabbards copied from Bronze Age graves and paintings and reliefs. But his swords are sharp, and the only hints about how people in the Late Bronze Age used their weapons are the two-faced evidence of art and the weapons themselves and parallels in later martial arts. Burridge’s swords tend to be bought by collectors and museums to display, by archaeologists to experiment with, by reenactors to wear, and by enthusiasts to reap a dreadful harvest of plastic bottles, Tatami mats, and gourds. 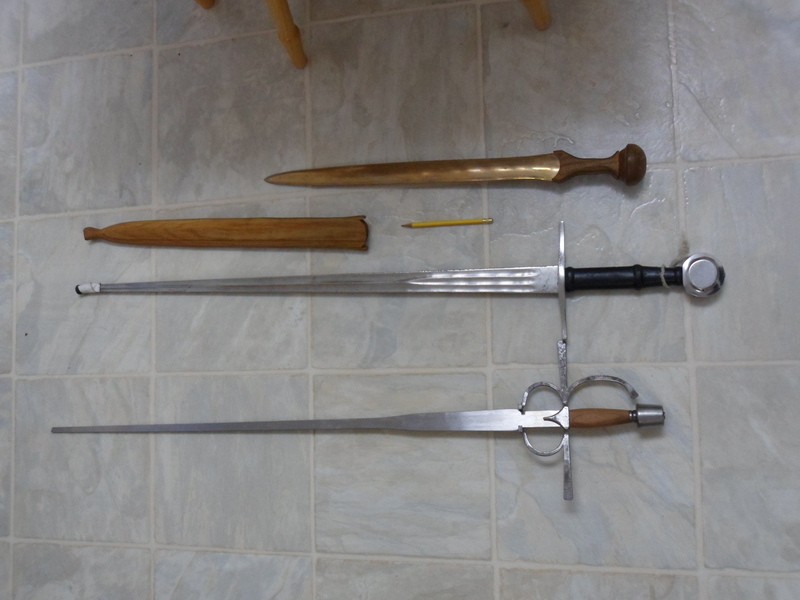 In the middle we have a Hanwei Practical Longsword purchased circa 2009. Hanwei manufactures its swords in China and sells to whoever will buy them. In this case, Hanwei tries to balance the wishes of show or reenactment fighters (who cut a lot and want a weapon which looks impressive but rarely thrust for safety reasons and are often not very interested in how the originals behave), of historical fencers (who want swords which move like sharp originals and have some ‘give’ when they thrust into a solid target), and of people who want a sword to wear on the stage or at a renaissance fair while keeping the price low. Hanwei even include a hideous fibreglass scabbard. The result is a blunt sword which partially satisfies many different people’s desires. Yet it turns out that it is extremely difficult to make a sword which simultaneously flexes in the debole, has a thick rounded edge for safety and to withstand abuse by poorly trained fencers, and looks like a sharp sword from a distance. The third sword, a Spanish Destreza Training Sword by Scott Wilson of Darkwood Armoury, takes a radical approach to designing a blunt sword for fencing practice. The blade has a visible ‘step’ to put the point of balance in the right spot and allow the debole to be thin and flexible while leaving enough mass in the forte to parry powerful blows. People who are serious about Spanish and 16th century Italian fencing usually approve, and I suspect that some people who practice other kinds of fencing find this solution a good one. But it does not look as much like a sharp sword from a distance as the Hanwei, or come with a scabbard, and by having an appropriate length for some styles of fencing it may be inappropriately short for others. Moreover, the decisions which make the Darkwood and the Hanwei appropriate for safe fencing make them inappropriate for practicing cutting through things and an imperfect guide to how the sharp swords which they imitate moved. (After all, a weapon which behaved exactly like a particular sharp sword would have to be sharp!) The need to keep the price low forces them to design blades which can be ground efficiently from modern steel bars with modern power tools. These are three very different swords, not just because they are modelled on three very different weapons, but also because their makers made different choices about which of the types of modern fun with swords they would appeal to. In the new year, I hope that more people who have fun with swords can remember that the people who make their tools have to balance the wishes of many different types of customer. perspective on modern blunt practice swords with more experience with originals than I have but less curiosity about why a particular modern sword is made the way it is, see Florian Fortner and Julian Schrattenecker, A Comparison of Late 16th to Early 17th Century Rapiers with Modern Reproductions.